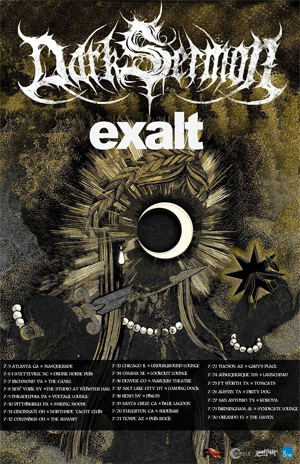 DARK SERMON has announced the dates of their upcoming U.S. headline tour featuring special guest EXALT. DARK SERMON will be touring in support of their latest record The Oracle (eOne Music) which is available now on iTunes. The band is currently on tour with THY ART IS MURDER, RINGS OF SATURN, & FIT FOR AN AUTOPSY ("The Coffin Dragger Tour") with the headlne tour kicking off on July 5th in Atlanta, Georgia working its way throughout the U.S. wrapping up on July 30th in Orlando, Florida. Watch DARK SERMON's "Rat King" music video on KNAC.COM right HERE.